Today is my favorite day of the week. Has been for more than 20 years now. Want to know why? You'd have to follow me to the intersection of Golf Links and 7th street, walk into a room filled with talkative ladies ranging in age from early 20s to mid 80s, grab a cup of coffee and sit down with us all. And then we'd open our Bibles. 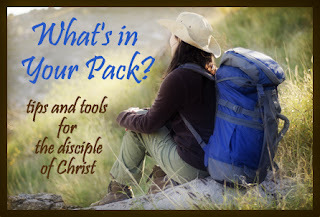 Since many of us are attempting once again to complete a Bible study - new year's resolutions and all, you know - I thought you might enjoy a repost of one of my more popular posts from the past. Enjoy! Oh, and Happy Wednesday! It's Bible study day! If I know anything about my readers at all, I'm pretty sure that many of you have either just begun a group Bible study or you're about to get started shortly. 'Tis the season! Let me ask you a few questions about that. Do you usually complete the Bible studies you begin? And by complete, I mean do you successfully finish all of the work in the workbook and attend all or most of the class sessions? And by complete, I mean do you get all you can out of it? Do you look back and realize, perhaps with a little awe, that you've actually changed over the course of the past 8 or 11 or 22 weeks due to your time in the Word of God? My hope is that many of you would concur that you truly do complete the studies you start. But after teaching women's Bible studies for over 20 years now, I'm experienced enough to know that many women do not manage to get to the finish date with a completed workbook, much less checks in all of the spaces beside their name on the attendance roll. And, worse yet, many women get halfway through a study and then find themselves checking out of it discouraged, defeated, and even, sometimes, swearing off the notion of taking future Bible studies. Listen, it's not easy for me to complete a study either. I've often joked that one of the reasons God has me teaching Bible studies to groups of women to whom I am accountable is because He knows I wouldn't do my homework otherwise. Fact is, this is no joking matter. It's the truth! I find every excuse in the book to put off my assignments just like the next woman. Once I've completed my daily study, I'm so glad I did and I feel challenged, informed, invigorated, and refreshed by God's Word. But I struggle to open my study book and Bible as much as you do. I'd like to offer you 9 tips for enduring to the end in Bible study this year so that "endurance" can have its perfect work in you and you'll be complete, lacking in nothing (James 1:4)! Now, I need to prepare you; some of these will sound a little stern, a little stiff. But, sister, sometimes that's what it takes to endure! E - Enlist a study buddy for accountability. It's best if you can enlist a friend with whom you feel close enough to be gut level honest about whether or not you finished your homework, memorized the memory verse, did the special assignment, etc. But if you don't have that close of a friend with whom to take the study, you can always ask the teacher or facilitator to keep you personally accountable as well. Give her permission to privately ask you the tough questions! N - Never schedule anything on the day and time of your group sessions. I know that sounds stiff, but you need to protect this precious time just as you would a work assignment, a scheduled appointment, etc. Protect it at all costs, because if you don't and you miss a session, you are statistically more prone to quit doing your homework and skip the next session too. D - Determine a time for daily study and stick with it! Whether it's early morning, during your lunch hour, or late at night, carve out a time for dedicated Bible study and follow through. U - Understand the battle being waged around you. The last thing Satan wants is for you to unearth the treasures in God's Word. He doesn't want you to understand and embrace truth; that would keep you from believing his lies! So he will definitely fight you on this. With that knowledge in mind, fight the good fight and carry on! A - Ask for help. First, in prayer ask God to help you hunger for His Word, study it diligently, and apply it correctly. Seek the Holy Spirit's help each time you sit down to study. But also ask your group facilitator for help if you ever get stuck in the homework or have difficulty understanding a passage or an assignment. Don't let defeat set in because you won't ask for help. N - Necessitate your attendance. Here is one of the best tricks for completing a study. Make your attendance at group sessions indispensable. Volunteer to help with administrative tasks, to make the coffee each week, to be a table discussion leader or to give someone else a ride. Rope yourself into this thing. I'm telling you, it works for me! C - Commit to the study. This may sound very basic and elementary, but you'd be surprised how many women tell me they're going to "give Bible study a try." That never works. Those folks are the first ones I start missing on Wednesdays. In fact, many of them buy the book and never even show up. Commitment is key! E - Enjoy the study! Make it fun. Get to know the women in your group. Go to lunch with them, exchange recipes and books with each other, meet new women during the coffee break, wear something special to class, buy new highlighters for the study, and enjoy feasting on the Bread of Life! Approach Bible study with a glad heart! 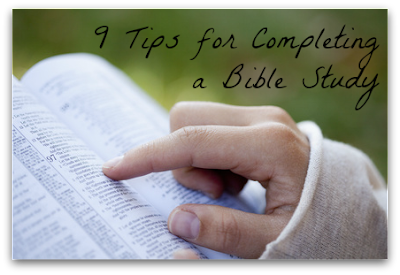 What tips do you have for women who are struggling to complete their Bible study? How did you overcome the hurdles you have faced in this area? We'd love to know!